Before drain camera’s plumbers had to excavate the entire length of the sewer line in order to determin where repairs were necessary. The snake camera is attached to a screen for real time visualization that can also be recorded. These plumbing cameras can help visualize clogs and damage to pipes and sewer systems quickly in residential and commercial buildings. As a plumber finding the root cause of the problem in a pipe or sewer system in a timely manner will greatly increase productivity. Being able to use a pipe camera to visualize problems will aid you in permanently fixing plumbing problems the first time they occur. Knowing the specific nature of a plumbing problem will also help you better determine the most efficient way to deal with drain problems, saving you and your customers, time, effort, and money. What are the most common causes to sewer line problems? Tree roots, collapsed pipe lines, clogs, cracks in the pipe, and faulty installations. If you are experiencing issues such as sewage backups or your household drains are all slow, you may want to consider calling 24Seven Plumbing to perform a sewer camera inspection. 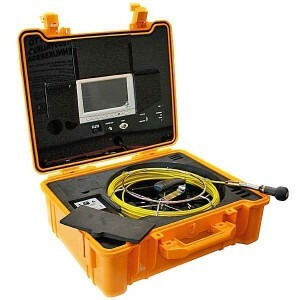 This allows us to look far into a sewer drain and locate the exact location and depth of your sewer’s problem – without excavating and damaging your lawn. This typically expedites the time it takes to complete the repair.